The mailing label indicates I have a one year subscription. I didn't buy it. One of the lead articles suggests to add more fruit to your diet. 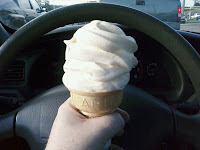 Funny, someone taking a picture with one hand of an icecream cone in the other ran me off the road. Just kidding.. The icecream does look good..I miss fries also, along with bread, pasta and anything else loaded with carbs. BTW whats up with "LOST" making us wait 2 weeks for the Kate/Jack/Sawyer reunion?